There is a charming story about an exchange that took place between a rabbi and a little boy. This is one of those truly beautiful reads to have on hand for a quiet Shabbat afternoon – when time stands still and you are tented in the menuha (stillness, quiet, peace, and harmony) of Shabbat. Extremely personal, this autobiographical read both captivates and inspires the heart to love G-d and to love others. A masterful storyteller, Rebbetzin Jungreis, teaches nuggets of wisdom through her stories of family, her children, her people, and her beloved husband, Rabbi Meshulem HaLevi Jungreis. Drawing from the deep wells of Scripture and rich teachings of the Sages, Rebbetzin Jungreis encourages each and everyone of us to make the choice to participate in tikkun olam (healing of the world). Rebbetzin Jungreis grew up in a Torah rich home (her father was chief Orthodox Rabbi of Szeged, Hungry, during the Nazi occupation and the family was taken to Bergen-Belsen concentration camp). As a survivor, she carried forward the legacy, passed down through the generations before her, of commitment to kindness, truth, love, and faith; all inspired by a deep of love of G-d and His Word. Passing on this heritage to her children, Rebbetzin Jungreis challenges the reader to do the same – to leave a heritage to our children that has eternal worth. Rebbetzin Jungreis touches on subjects such as: inviting G-d into your life, responsibility, charity, family life, prayer, forgiveness, compassion, faith, hope gratitude, time, self-control, marriage, and keeping Shabbat. Deeply affecting, this book encourages one to reach for a deeply personal, visceral relationship with G-d and also to make a commitment to live a life bigger than ourselves. A life permeated with the purpose of Heaven. Truly one of the most touching books I’ve read, I’m on my second read and drinking deeply. 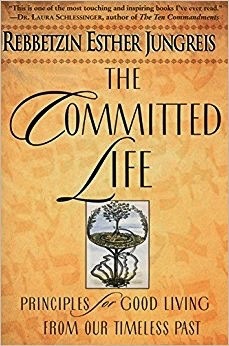 The Committed Life is a read that profoundly touches the heart. Such a sweet spirit and kind soul – the following is a YouTube clip of the conclusion of her testimony regarding the Shoah. ((((Jenny)))) thank you ~ you are always such an encouragement! I must get it! Your review has made it irresistible. Oh Debbie you will so enjoy it!